That incident — and the night in jail that followed — was Carrasquillo’s introduction to the practice known as stop-and-frisk, a lynchpin of police policy in New York since the mid-’90s that has only grown more pervasive since Carrasquillo’s youth. Every year in New York City, the police stop hundreds of thousands of people and frisk them for guns and drugs, often arresting them for possession of small amounts of pot. Largely because the vast majority of those stopped and arrested are black and Latino, this practice has caused an uproar, culminating in a billintroduced on Wednesday that would legalize marijuana in the state. Carrasquillo, who is black, Puerto Rican and Cuban, has become a prominent figure in the debate. The morning after the bill was announced, Carrasquillo spoke about his history of pot arrests while sitting at the Brooklyn headquarters of VOCAL-NY, the drug-reform advocacy group that employs him as a community organizer. 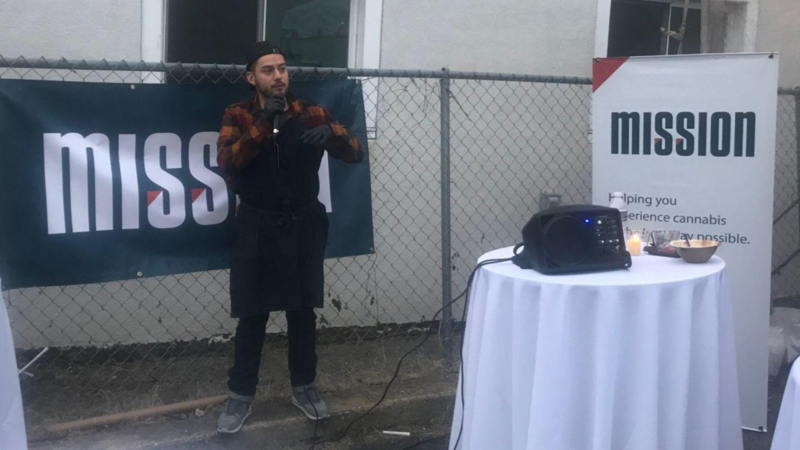 Carrasquillo estimates he’s been arrested on marijuana charges about 20 times in his life, and although most of the charges were dropped, he said the arrests made it hard for him to get a job until he found his calling as a community organizer. “No one directly said, ‘We’re not going to hire you because of your arrest record,’ but for some reason I was never hired,” he said. Shapriece Townsend, a 22-year-old from Harlem, sat with with Carrasquillo on Thursday. Townsend said he lost his job at a pharmacy after he was arrested and jailed for three days for marijuana possession last year. 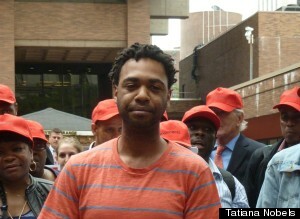 Alfredo Carrasquillo, pictured here at a rally in front of New York City’s police headquarters, has become a prominent figure in the debate over marijuana arrests. He had been heading home from his grandmother’s apartment in Brooklyn when he saw a police car tailing behind him. “I thought I’d put a little pep in my step,” he said. Supporters of stop-and-frisk and marijuana arrests credit such tactics for the precipitous drop in New York’s crime rate over the last 15 years. They argue that the police are keeping residents of low-income neighborhoods safe by rounding up young people and taking guns off them. But critics say that the police often go too far, noting that only a small percentageof police stops result in the recovery of a weapon. What’s more, the police themselves often violate the law when arresting people for pot, according to advocates. Under a 1977 state law, possession of a small amount of marijuana is only punishable by an arrest and jail time if “such marihuana is burning or open to public view,” as the penal code puts it, in its particular way. Advocates say most marijuana arrests are made only after the police force suspects to empty their pockets, which is illegal. And although the outgoing New York City police commissioner Ray Kelly recently directed officers to stop this practice, critics say it continues to be a problem. An analysis of the NYPD’s stop-and-frisk practice by the New York Civil Liberties Union found that innocent black and Latino New Yorkers were stopped 400,000 times in 2012, far more often than whites. The report also found that police made more arrests for marijuana possession last year than for any other crime. In the past year, the disproportionate arrest of blacks and Latinos for marijuana possession has prompted several reform efforts, and Mayor-elect Bill de Blasio rose to prominence this summer while vowing to improve relations between the police and black and Latino New Yorkers. At a press conference outside City Hall on Wednesday, state Sen. Liz Krueger, a Manhattan Democrat, specifically referred to the racial discrepancy in marijuana-arrest rates while announcing her proposal to end the prohibition of pot use altogether. The disproportionate arrest of blacks amounts to a “civil-rights disaster,” she said. The bill represents the third effort in 2013 to remove legal barriers to pot use in New York state. Proposals to legalize marijuana for seriously ill patients and to fix the “public view” loophole both passed the State Assembly earlier this year, but the state Senate adjourned in June without taking action on either measure. Advocates concede that the state’s failure to adopt those far more modest reforms doesn’t bode well for the new proposal. Still, they welcome the opportunity for a chance to talk about how drug laws affect people of color.